I spend a lot of time baking over the holidays for family & friends. And do you know who stares at me the whole time while I’m cooking? My dog. Since most of the goodies I bake aren’t good for dogs I decided to compromise. Each year I make a batch of special holiday dog treats just for her. It’s an easy way to make sure she’s included in all the festivities. 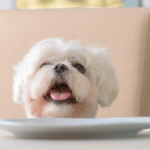 Give your dog something special (and yummy) this holiday season by making one of these great holiday dog treat recipes. 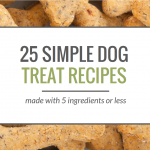 If you’re looking for even more dog treat recipes be sure to check out our list of 25 simple dog treat recipes made with 5 ingredients or less. 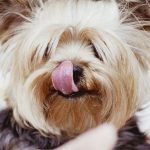 If you’re looking for an easy gift to give your dog this holiday you can’t go wrong with homemade dog treats. Turns out dogs really love treats (shocker, I know). With some Christmas themed cookie cutters and a nice container these also make a great gift for all of your dog owning friends. 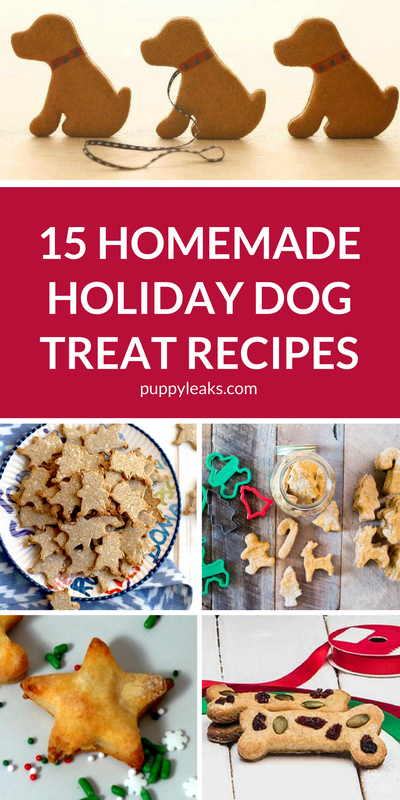 Here’s 15 of my favorite holiday themed dog treat recipes. This Christmas cookie dog treat recipe looks just as festive as all those human holiday treats we enjoy. They’re made with healthy, whole ingredients and topped with red cranberries and green pumpkin seeds. Looking for a special treat to make for your dog this holiday? Check out this yummy peppermint pinwheel dog treat recipe. They’re super cute and smell amazing. These apple mint dog treats are easy to make and look just as festive as human holiday snacks. They’re low in fat and calories, and they have a nice minty smell and taste. This minty Christmas dog treat recipe is easy to make, and they’re a great way to give your dog something special over the holidays. If you’re looking for a way to include your dog in the season’s festivities these sweet potato dog treats are a yummy choice. Does your dog deserve something extra special this Christmas? These easy Christmas DIY dog cookies are a great way to treat your dog over the holidays. These snickerdoodle dog biscuits are easy to make, use simple ingredients and smell amazing. If you’re looking to give your dog something extra special this holiday season you can’t go wrong with this recipe. This candy cane dog treat recipe is easy to make, and they’re a great way to give your dog something extra special (and super cute) this holiday season. Looking for a simple and healthy treat to make for your dog this Christmas? This apple cranberry dog treat recipe is one of my favorites. They’re easy to make and use simple ingredients. 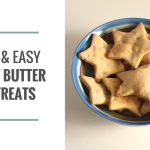 Baking goodies is a tradition for many of us around the holidays, and these peanut butter dog treats (3rd recipe on the page) are a great way to include your dog in the festivities. If you’re looking for a healthy yet simple dog treat recipe to make for your dog this Christmas give these a try. 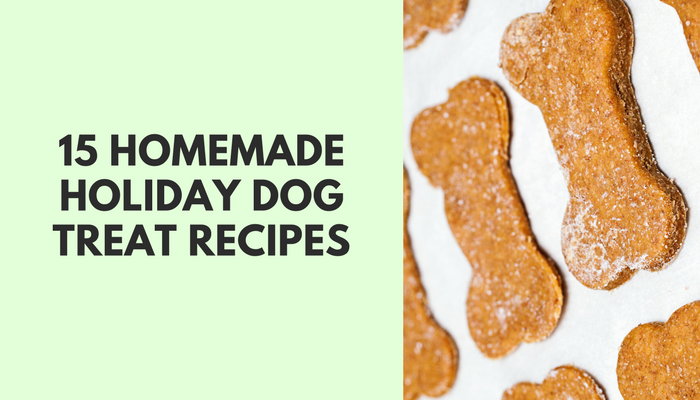 Gingerbread cookies are a staple during the holidays, and this great recipe adapted for dogs is an easy way to include your dog in this year’s festivities. These Christmas turkey tree dog treats are a great low fat option for dogs. Spirulina powder is what gives these treats their festive green color, in addition to a boost of omega-3 fatty acids. If you’re looking for a simple treat recipe to make for your dog during the holidays check out these grain-free sweet potato dog treats. If you’re looking to give your dog something extra special this holiday season make them some of these Christmas cookies. I’ve been doing more baking in an effort to keep the boat warm. Looks like lots of yummy options–Honey says thank you. I will have to try making these dog treats! I’m sure both my puppies will thank you!